Two weeks ago, as I was browsing in Hobby Lobby, they had a fantastic 50% off sale on most of their beads. I wanted to try my hand at making a multi-layered pearl necklace with some vintage glass and a unique pendant that I have. Glass pearls would be perfect, I love the way they feel. There were so many to choose from, but I bought several sizes of the off white ones. I also bought a few strands of the black pearls, they were lovely. The weight and sheen is so nice. They were a great buy at half off, so I stocked up. I know a few girls who might like these necklaces! The other beads I bought will incorporate nicely, they were a periwinkle faceted glass, again in multiple sizes. I will share pictures when I have finished them. If you need inspiration for a design, the Beadin' Path is the place to go. I stumbled upon this site and it is a great find. Just look at these earrings. They have tutorials and material lists available. You can click what you need right into your basket. Way, way to easy...and dangerous! 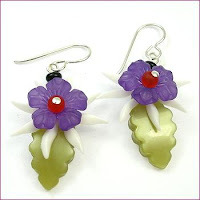 Go there and see for yourself, there are pages and pages of free designs for earrings, necklaces, and bracelets, as well as, how-tos on basic beading. These pieces would make the perfect gift. So, jewelry has been on my mind lately, especially the handmade lovelies! This one is from my summer swap partner, Ellen of Village Fiber Works. I have been wearing it a lot lately and receiving many compliments...thanks again, Ellen. Here is the picture of the fiber necklace I made for her. She loved it and I was so glad. I definitely want to make more of these. It was fun to use my wool singles and my felted balls (courtesy of Woolly Fabulous). Go make yourself something fabulous...and don't forget to share! Oh so gorgeous your necklace is! Did that sound like Yoda? Love the beadwork - glad some people have the patience for it!